Advisor, General Patrick J. Halloran, struck by car while crossing street in his hometown of Colorado Springs, CO. Ten days ago, the first of July 2017, while crossing the street, the General (pictured as a Colonel at left) was hit by a speeding automobile and seriously injured, suffering fractures to both hips and 9 broken ribs. Although hardly comfortable, he has nevertheless emailed your editor some advice on an aviation matter, as though nothing had happened. This musician turned accomplished military and civilian aviator, continues to fly to this day. The General was the second former CO of the First Aero Squadron to join the ranks of our Board of Advisors. Colonel Chi Chi Rodriguez was the first. The General is one of Minnesota’s most distinguished aviators, and has been honored by special displays concerning his unusual career in the Minnesota Military Museum. After graduating from Chatfield (Minnesota) High School in 1946, he attended the MacPhail Conservatory of Music in Minneapolis for several years before enlisting in the Air Force in 1949. Early years as a pilot. When he joined the Air Force, Halloran became an Aviation Cadet. He received his wings and officer’s commission in September of 1950, graduating at Williams Air Force Base, AZ. He spent his first seven years flying F-84 jet fighters from bases in Georgia, Maine, Oklahoma, England, Alaska, Puerto Rico and Japan. He also flew 100 combat missions in the F-84 over North Korea in 1952. Reconnaissance. In 1956 he was selected for the first group of pilots to fly the new, secret U-2 high altitude reconnaissance aircraft for the Air Force. The U-2 flew at altitudes of over 70,000 feet and carried enough fuel for ten hours of flight. In 1965, he became one of the first pilots to fly the new, long-range, Mach 3 SR-71 “Blackbird,” an aircraft he then flew for almost eight years. The SR-71 was the fastest, highest flying jet aircraft in the world, cruising at over 2000 mph at over 85,000 feet and with a range of over 3,000 miles. The SR-71 could accelerate so fast that it was able to out fly surface-to-air missiles. Halloran accumulated nearly 600 hours in the SR-71. He flew missions over Cuba in the U-2 and the SR-71 Blackbird over Vietnam in both the U-2 and the SR-71. The General, in his space suit posing in front of the world’s fastest jet, the SR-71 Blackbird. He was honored to be one of its select pilots. In 1971 he received his Bachelor of Arts degree in social science from Troy State University in Alabama and also completed the Air War College, Maxwell Air Force Base, Alabama, as a distinguished graduate. Command and Staff. 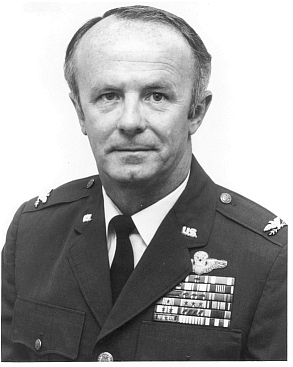 In 1969 Halloran was appointed commander of the 1st Strategic Reconnaissance Squadron (First Aero Squadron), the first of several high-level command and staff assignments that took him to various headquarters, including 3rd Air Division in Guam, 15th Air Force in California, and Strategic Air Command in Nebraska. His final assignment was in the Office of the Joint Chiefs of Staff, in the Pentagon. Retirement. Halloran retired in 1983 with over 8,000 hours of flying time in the military and 34 years of service. He has over 12,000 hours of total flying time. He was inducted into the Minnesota Aviation Hall of Fame in 2006 and now lives in Colorado Springs. He remains actively involved in the Experimental Aircraft Association (EAA), of which he is a long time member. Over the years he has also flown some famous civilian airplanes, including the famous pre WWII racer, the the famed Schoenfeldt “Firecracker” race plane (seen immediately below left), the same one piloted by renown Lockheed Aircraft Corporation test pilot Tony Levier, back in 1938, when he used it to win the International Air Races at Oakland, CA. 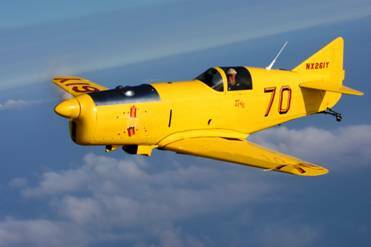 General Pat Halloran Flying the Famous Race Plane, the “Firecracker” Click on above text to see his personally written story. The renown British DeHavilland DH 88 Comet racer . . . The General was an active member of the Riverside (CA) Flabob Airport’s EAA Chapter Number 1, the very first chapter in the EAA. The General has also flown the renown British DeHavilland DH 88 Comet racer, which can be seen above in its bright red racing colors. We wish the General a speedy and full recovery! This entry was posted in HOT NEWS! on July 11, 2017 by FASFRIC.